“Vangaraa Marbilani Tharoduyar Kodasaya”. The song came from a woman devotee. The venue was the hall before the sanctum sanctorum of Lord Palani Andavar. Among the many devotees who were waiting for the opening of the doors, Ardhanari was also one. While all others just heard this song, for Ardhanari, the song made an enormous impression. He could discern some power in that song. Though Ardhanari, not well versed in Tamil, could not know the meaning, by hearing it, he experienced an inexplicable sense of affinity towards Muruga. However, even after the lady completed singing, the doors opened and worship over, the song was ringing in the ears of Ardhanari. It has made a profound impact on him. Ardhanari, working as a cook in Mysore Palace, was a disturbed man. He had faced one storm after another in his life. His wife and three children died one after another. Though he married again and was blessed with three children, sorrows and sufferings continued to chase him. His two daughters also passed away. As if these sorrows were not enough, he suffered acute pain in his stomach due to some disease. Then someone in the palace suggested: “Why not see, Palani Andavar’, the Lord of infinite grace?” It was that suggestion which brought Ardhanari to Palani and got him an opportunity to listen to the song; the song that later brought a transformation in his life. “What is that song which creates so much vibration in me”, Ardhanari wondered. He was determined to find out who composed that song, how it described Muruga and what message it contained. He enquired and found out that the song which captivated him is known as ‘Thiruppugazh’, composed by saint Arunagirinathar. He realized that he should learn Tamil well to be able to appreciate Thiruppugazh fully. He made friendship with an eight-year-old boy named Mani and learned Tamil from him. He managed to get a Thiruppugazh book from Chennai and learned Thiruppugazh songs. Needless to say, the pain in the stomach that was distracting him gradually ceased. He now understood that the song he heard at Palani described the majesty of Muruga, His broad shoulders adorned with garlands and the peacock nearby. With the grace of Palani Muruga, Ardhanari soon became an eloquent singer and commentator of Thiruppugazh. He found Thiruppugazh as the means of liberation from the world of sorrows and sufferings. Ardhanari wanted to experience the bliss of being near Maharshi. With Tiruvannamalai as his base, he continued to visit Maharshi. He recalled what Bhagavan often said that the Self, which is the reflection of Brahman, is the eternal Guru. He knew that Bhagavan rarely gave either a glimpse (nayana diksha) or a touch (sparsa disksha). He therefore did not pursue his wish to get a formal advice or diksha. He made it a practice to do daily circumambulation of Arunachala Hill (Girivalam) by singing Thiruppugazh. Soon, few devotees joined him and they all came round Arunachala hill, singing Thiruppugazh songs in chorus. Then the most unforgettable moment came. It so happened that the time he went round the hill coincided with the time chosen by Bhagavan. While walking through the Girivalam pathway, singing ‘Vedichi Kavalan Vakuppu’ (songs hailing Muruga as Protector), he was pleasantly surprised to see Bhagavan also walking quite nearby. His joy knew no bounds when Maharshi also joined in Thiruppugazh rendering. Ardhanari who considered Maharshi as the manifestation of Muruga was elated at having Muruga as his co-singer. The Atman in me is your reflection. Girija, the mountain-born Parvati is my intelligence. My vital energies (Prana) are your companions. My body is where you reside. Whatever I do with my senses are your worship. When I go to sleep, I experience your state of Samadhi. The walking I do is for circumambulation of your feet. Whatever words that come out of my mouth are hymns of your glory. Whatever act I do are my form of worship to you. (2) Sri Seshadri Swamigal is 10 years elder to Sri Ramana Maharshi. He mastered Vedanta, Gita, Upanishads and Brahma Sutras at a young age. He was initiated to sainthood by Sri Balaji Swamigal. . After visiting many holy places, Swamiji arrived at Tiruvannamalai He began doing his meditation in Rudrabhoomi (cremation ground). He mostly remained in the company of Sri Ramana Maharshi. He became too familiar with the residents of Tiruvannamalai. They said there are three Siva Lingas in Tiruvannamalai; one is Arunachaleswar, the second is Sri Ramana Maharshi and the third is Sri Seshadri Swamigal. When he remained in Sahaja Samadhi, there was no need for food for many days. He even conquered the three states of Sushupti (deep sleep), Jagrata (waking) and swapna and attained the fourth state of Turiya. When people approached him and sought his blessings for some material gains, he told them in clear terms their salvation lies in distancing themselves from the world of illusion and realizing the Atma within. He lived in Tiruvannamalai for about 40 years and attained Maha Samadhi in January 1950. This meeting became a turning point in the life of Ardanari and he saw clearly the aim of his life and the direction it should take. He felt that his inner vision had opened up. Sachidananda Swamigal has now realised that Sri Ramana Maharshi had foreseen these developments in advance and it was only to create a ground for such meeting he directed Ardanari to leave Tiruvannamalai. Muruganar has said that Ramana Bhagavan is the manifestation of Muruga. Sachidananda Swamigal has now realized that by asking him to leave, Bhagavan Ramana has only brought him near to Muruga. Vallimalai is situated near Tiruvalam in 80th mile from Chennai to Bangalore highway. It was here, Valli, who had a divine origin in her previous birth, was born to Nambirajan couple. As an embodiment of humbleness, she was guarding the millet crops in the Vallimalai region. According to legend, Lord Muruga heard about her qualities of humility and simplicity, came to Vallimalai and managed to win her heart by various means. Normally, the aspiration of the individual Jiva to be united with eternal reality, the Brahman, is described as Jiva Brahma Aikyam, but in case of Valli, the individual, it is described as Valli Sanmargam where Muruga who symbolized the Brahman, came in search of the individual, Valli and aspired to be united. Sachidananda Swamigal had chosen a cave in the mountain called Parvata Rajan Kundru from where he pursued his Thiruppugazh mission. He founded a temple for Valli, known in local parlance as Pongi. He went to different places in India and conducted Thiruppugazh recital. Surprisingly, after arrival at Vallimalai, Swamigal who had no knowledge of music, started singing quite perfectly. He devised the proper method of rendering Thiruppugazh, known as ‘Thiruppugazh Parayana Thava Neri Thirumurai”. He choose all forums to hail the glory of Thiruppugazh. 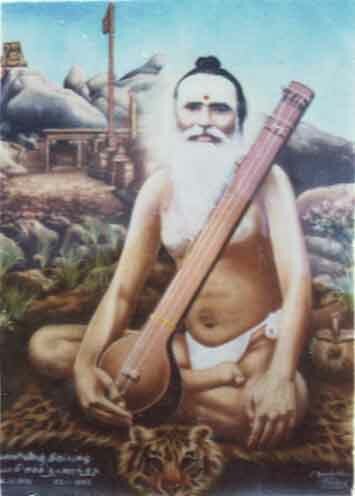 The name Sachidananda Swamigal became synonymous with Thiruppugazh. He established Padi Vizha festival by which every English New Year, devotees climb the Tiruthani hill by singing Thiruppugazh Bhajan at every 365 step. He attained Maha Samadhi in November 1950, about 7 months after Bhagavan attained Maha Samadhi. From time to time, great saints appear in this land and conduct the people to the right destination. Every saint comes with his or her own philosophy and imparts knowledge and devotion so that devotees in different levels of understanding can choose the path that suits them most. The saints advocate a method that suits the age of his period. Though the means are different, ultimately the end remained same, the Atma Jnana or Self-realization. 1. Thiruppugzh Parayana Thava Nerith Thiruppugazh’ released by Sadhu Parthasarathi on the occasion of Jayanthi Vizha of Sri Vallimalai Sachidananda Swamigal. 2. “Arunachala Mahimai” by Bharanidharan published by Kalainjan Pathippakam, 9 Kannadasan Salai, T. Nagar, Chennai 600017.